Ricketts Cricuts: Ribbon and Rhinestones Birthday Blog Hop! Welcome to the Ribbon and Rhinestones Birthday Blog Hop! Happy Birthday to Stacey!!! I am so honored to be apart of this fun celebration! If you just happened to come across my blog and want to start at the beginning click here!I decided to make two projects to include both ribbon and rhinestones. Here they are! Here is an A2 card. I used the Greeting Farm Cupcake Anya Digital Stamp. The paper is from the All Dressed up DCWV stack. I love the glitter and bling it has. 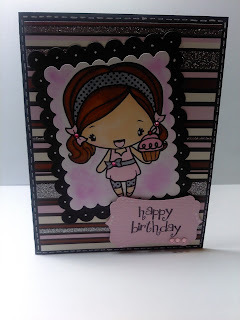 I cut out the image using my scalloped rectangle spellbinders set. 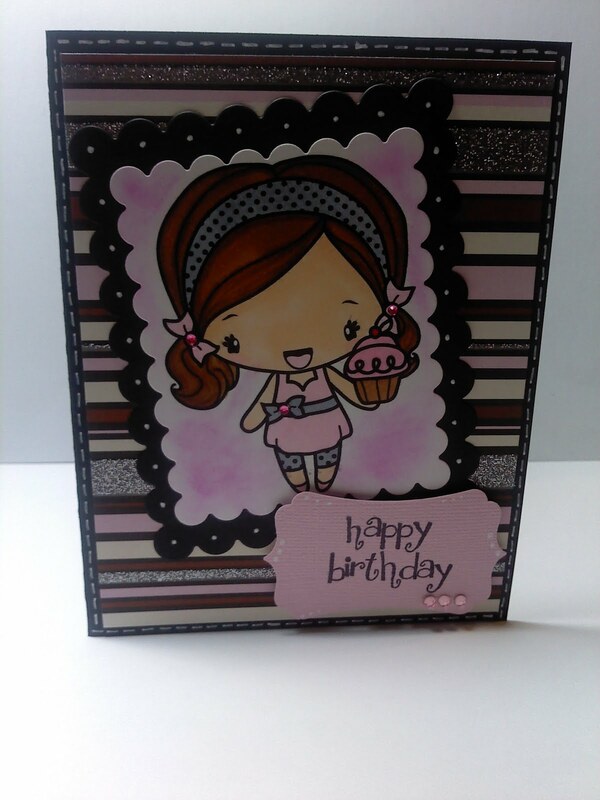 The birthday sentiment is from the new release Pink By Design birthday set. 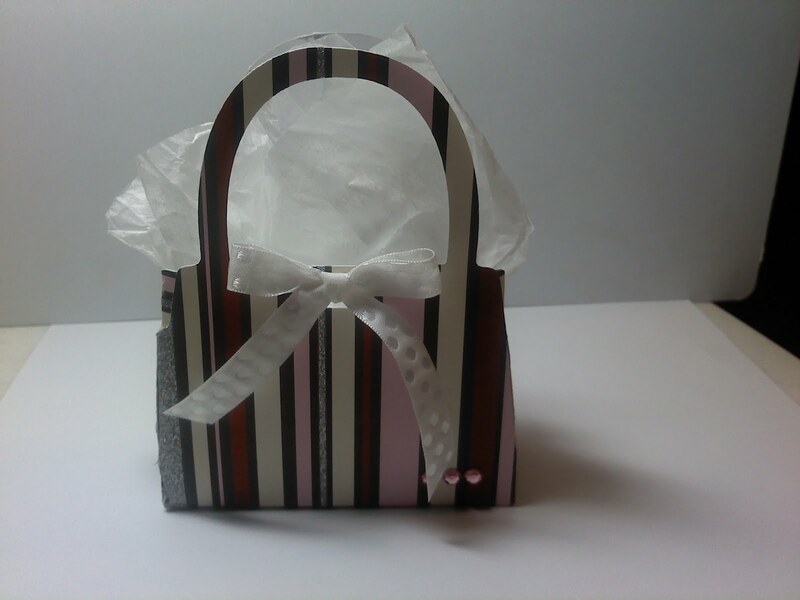 Here is a fun gift bag made with matching paper. I added some textured white ribbon and pink rhinestones. Now for some blog candy~ I will give away one recipe book to a lucky follower. All you have to do is leave a comment with your contact information. I can only send with in the US. If you would like to see a picture of one click here on my Facebook fan page. Your next stop is the amazing Gina! Here is the rest of the blog hop lineup! aww awesome cards. the lil girl is cute. I too love making bags.. new follower, i believe. That is so lovely, love the papers!! What a delightful card and little bag! And those recipe books are fabulous! Would love to win one of your creations! Thanks for the chance. Very delicate bag & card is fab... great to op with you!!! So sweet Kim. I love that little girl. I need some of those stamps. awesome love it.....so cute cute cute..TFS!!! Very cute projects! New follower. They look fantastic!!! I love the colors you went with. Good work hun! How sweet kim!! I just love lil anya!! The bag and the card are adorable!!! Love the papers you used!!! I love this---it is so cute. I am a new follower and am glad I found your blog. Cute card and bag set. Nice papers. So cute. I'm a new follower. I love the cute bag you made to coordinate with the card!! I'm a new follower so can't wait to see what else you come up with!! very nice project love the bag ! what a great Idea to put candy or something in I hope you have fun teaching its such an important job that doesnt get a lot of credit !! New follower ! This is such an adorable card. It's a great pleasure being in the hop with you! Love your blog!!!! And Love your project great job! Love these projects Kim! That DCVW paper is just fabulous isn't it? Adds class to everything it touches :) Very cute! Great project! I love seeing what everyone makes on these hops! I would love to get a recipe book since I love to cook! Love both of your projects! So cute! I follow as squiggles87. Love both of these. The paper is pretty too! Your recipe books are adorable. TFS and for the chance to win one! I am a new follower! very very cute! love the little girl Ive never done the digital stamps before..mmm I may need some cause they are adorable ! this is absolutely adorable! You are very talented! Love the darling card and the bag is too cute! How cute your projects are. I love that little gift bag! Love it. Great job. I love your coloring. TFS your talent with me. Super cute, love the Greeting Farm stamp. Great card and gift bag. Thanks for sharing. I love Blog Hops, I learn so much! I'm not much of a cook, but I bet I could fill it up with what little I do know!! Wonderful card and gift bag! I love that DCWV stack. I am a new follower. Kim you did a great job. I just love the gift bag it's very pretty!!! I'm already a follower of your blog and glad that I am. Thanks for offering up a great receipe book. Hi there--love the card and matching bag set--that is too cute!